Sun's out, not long until Crackerjack and the pair of us are reduced to the state of poor pedallers. Upside, no motor equals no emissions. Downside, our operational range is severely compromised. Sometimes a great notion: how's about, I propose, a trip to M&S? 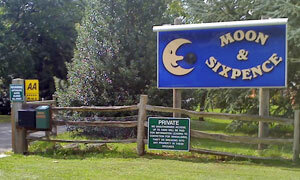 No, not that M&S, home of tiresome queues and tasty chilli, but the Moon & Sixpence. Retracing our steps from three-cubed months ago, it's straight on past Waldringfield Golf Club, up and down one or two inclines, and here it is, a stone's throw from the middle of nowhere. Stay in a holiday home, bring your caravan or throw up a tent, choice is yours. There was talk on their website of a restaurant, bar and shop. Ah, said the lady in the shop, restaurant isn't open until 6pm, so no hot food, I'm afraid. Not to worry. We'll settle for a sandwich. Oh, she continued, there aren't any. Frozen food: yes. VHS videos to borrow: yes. Washing powder: yes. Ready to eat savoury food: not as such. At which point, we gave serious consideration to buying a packet of bacon and a loaf of bread. So, a low point in the long history of light lunches with a minimalist (a) packet of Walker's and (b) strawberry Yazoo. Still, good for the spirit to sit out in the sunshine eating crisps while imagining an all-day breakfast mega-bap from the golf club down the road. Quick circuit of the lake afore a pleasant ride back through the woods to emerge near Martlesham Community Hall. Then into Tesco for coffee and cake. Sometimes you've got to know when you're beaten. If it was a car -- Mooveo P608. If they were passing by -- Roger Sloman.